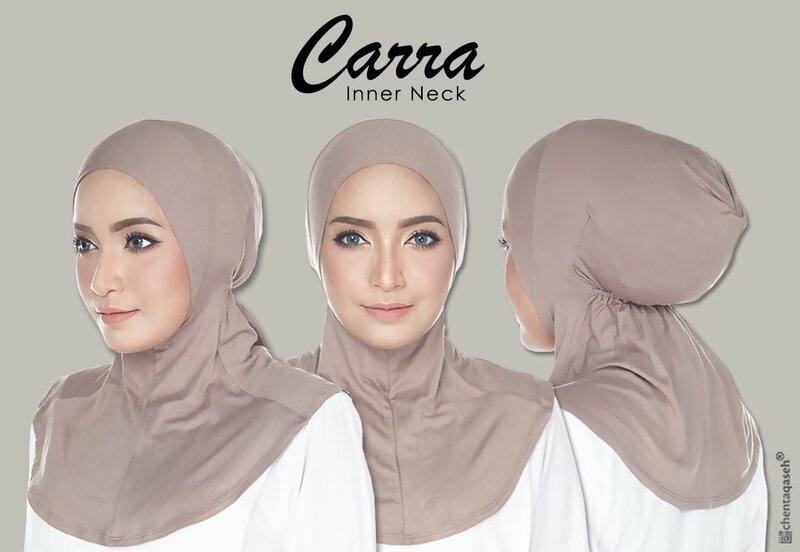 CARRA IS CHENTA QASEH’S OWN TAILOR-MADE INNER NECK COLLECTION. ​ FRONT AND BACK​ (MEANING THAT MORE AMOUNT OF FABRIC IS USED) TO ENSURE IT COVERS YOU PERFECTLY. SUPER EASY TO WEAR AND THE CUTTING IS VERY NEAT AND HAS A WONDERFUL SHAPE BUT YOU WON’T FEEL AIRLESS AS IT JUST FIT YOUR HEAD PERFECTLY. MOST IMPORTANT THING THERE’S NO ZIP AT THE BACK (AS SO MANY WOULD INQUIRE ON THIS). SEWN FROM HIGH QUALITY OF COTTON LYCRA WHICH IS VERY COMFORTABLE, COOLING, SOFT AND LIGHT. MATCH IT WITH YOUR FAVOURITE HIJABS OR SHAWLS.